KayKiSpeaks.com: Happy BranDay! 10 Things You Can Learn from My Fave! Happy BranDay! 10 Things You Can Learn from My Fave! Want to send warm birthday love and BRIGHT light to my fave, Brandy today! It's been a pleasure to listen to and to meet such a gift to music. So funny and personable, so talented, but yet so humble. Here are 10 things we can all learn from my fave! 1.) Honesty is a silent strength: Bran has been more than vocal as an adult about her personal struggles and growth. What it does for fans is it allows us to know that even the people we think are exceptional humans, are still just human. I also think the best growth comes from self honesty. 2.) Be humble, if you're good at something, that something will speak for you: Man. Man. Man. Me and my stan self has wanted Bran to loudly rock her crown as the best voice of our generation many times, but she doesn't. She's arguably your faves fave, and imitated on a regular, but she doesn't boast or brag. In fact, she blushes away from the idea. This humility is beautiful, if you're great folks will know without you saying a word. 3.) Be resilient: Bran has faced many set backs and stumbling blocks in her career, but every time she bounced back. It probably is a lot easier to sit back and settle, but Bran is a prime example of getting back to life. 4.) 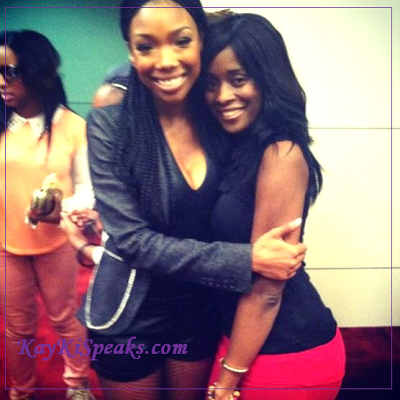 Inspire others: It's nothing for Brandy fans to get a few words of inspiration from Bran here and there. She will take the time to say hello, compliment, or encourage people around her and fans alike. 5.) Laugh a little: Bran is just hilarious. Whether it's her just clowning around for fun (we've seen the videos) or it's her acting as Chardonnay or someone else on television. She knows how to laugh. It's good for you! 6.) Correct your wrong: I can think of a couple of times in particular that Bran took to her social media to talk about being wrong and fixing it. Whether it was in a simple #Brandom quote or correcting a lost but important relationship with an old friend, Brandy has exemplified the importance of being able to admit and grow from your wrong. 7.) Keep God close: One thing I've noticed and more recently in a conversation she had with Vaughn over at BrandyBlog.com, Bran's faith is solid. Anytime she takes to social media to shed light to us she's always encouraging herself and us about how God is working through us! It's a beautiful thing. 8.) Family is important: I truly admire how much Brandy openly loves on her family especially her daughter and kid brother Ray J. Since the beginning of her career she's made it clear how much she adores her family. 9.) Use all of your gifts: some people fell in love with Brandy for her singing like me, others fell in love with her as Moesha, and some are recently falling for her as Chardonnay. Bran's ability to sorta carry on her career from the beginning as both an actress and a singer is commendable. Nobody said you had to be limited to one thing, exercise all of the gifts God gave you! 10.) Always be inspired: Even though Bran is my fave, she's sorta my fave indirectly. Whitney Houston was my first love and I think I fell for Bran because she reminded me of her somehow. Bran is never afraid to show her love for Whitney as an inspiration.. and really any other artist that she admires. Really, any other person she encounters. I think this quality only makes a person better. Can't close this out without remembering Whitney today. May she rest in love. I love Brandy, there's no one with a voice like hers, it's beautiful and unique.